Editor(s): Creech-Eakman, M. J.; Guzik, J. 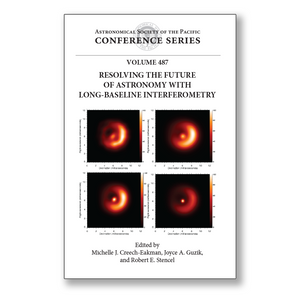 A.; Stencel, R. E.
This volume contains the proceedings of a cross-disciplinary science conference on optical and infrared high-angular-resolution interferometry held in March, 2011 on the campus of the New Mexico Institute of Mining and Technology in Socorro, New Mexico. The meeting attracted over 90 participants from three continents with all levels of expertise in the subject. The topics presented at the meeting included the theory and observations of celestial objects in the Solar System, the Galaxy (e.g., stars, binary stars, exoplanets, star forming regions, and stellar disks) and some extra-galactic objects, particularly active galactic nuclei, at the very highest angular resolutions possible using current technology. The conference included contributions from scientists working on several existing interferometers operating in the world, but focused on the promise of future high-resolution observations by new facilities and facility upgrades as envisioned by the researchers and theorists who study these objects. This volume will be of interest to researchers who wish to pursue high-angular- resolution imaging of many different types of celestial objects at milliarcsecond scales. The articles in this volume focus on known and potential observations of the types of systems listed above and predict potential areas of fruitful study for the future with interferometric techniques.